On Sunday the Broncos played their away fixture at La Manga, a surface that most struggle to play their best and came away as many teams have before them without a point. But it is important to not read too much into the result, but just enjoy the company and experience. 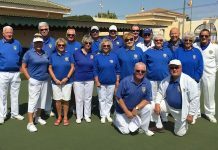 Monday found the Pintos playing host to La Marina Pathfinders, who are always great company and a pleasure to play, home or away. Some of the Pathfinders thought they would struggle to adjust to the mat but as all good players do, they found line and length very quickly. The Pintos took 3 rinks and the overall shots and good fun to boot. Meanwhile the Raiders were away to Country Bowls and conceding one rink, came away with just the 2 points with another rink pretty close. In the afternoon the Palominos were at Emerald Isle playing their Saturns, who proved too strong on the day for the Palominos, who came away empty handed. Sometimes it is just not your day or you are against a stronger team. A very windy Friday morning found the Mustangs playing host to Greenlands Oaks, with conditions making bowling accurately very difficult for both teams. But the home team did have a little advantage being more familiar with the mat. The Mustangs took 4 rinks with the other drawn and hence the overall shots. To all the bowlers we play, and their families, have a great Festive season from all at the Emerald Isle. In the Voyager Div, the Chestnuts were away to San Miguel. Final score – 65 – 103. Points – 3 – 9. Best winning rinks. – Veronica Richards, Margaret Hirst, Mike Cassidy. – 20 – 12. In the South Alicante League, The Maples were at home to Emerald Isle Neptunes. Final score – 61 – 64. 2 – 10. Winning rink was A Toozer, D Toozer, J Obrien. – 26 – 7. In the Winter League we were away to Emerald Isle, There were some terrific games played by all concerned resulting in final rink shoot – outs. Crucial shots were made with the very last bowl which showed just how close the two teams were. So, final score was – shots 73 – 84, points 2 – 10. Winning rink was -B Tomlin, Z Wilcock, J Wilcock, B Collins. 14 – 13. In the Southern League A Div, the Oaks were away to El Rancho Mustangs. A very demanding playing surface made even worse by the strong gusts of wind, combined to thwart every effort to tame it at the start of the game. We stuck to it and managed a good fight back so the final result does not reflect the game as a whole. Shots 61 – 92. Points – 1 – 11. In the Southern League C Div, The Cedars were at home to Emerald Isle Outlaws. Final score – 108 – 64. 8 – 4. Best winning rink was Brian Tomlin, Les Barber, Ann Eagle. 32 – 8. Monday morning saw the arrival of the El Rancho Raiders their intention, to pillage, burn and worst of all !! to steal our points. Faced by the “Magnificent 15” they left with just the 2 under their belts. 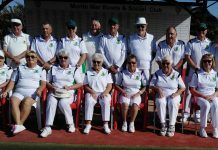 Just to be sure, the games were played in the best of bowling tradition and the Raiders left with Festive Wishes from all of the Country Bowls members to all of the El Rancho club. Results: Flamingos 10 – Raiders 2. One rink was uncontested giving us 10 shots plus 2 points. Many thanks to Sylvia Rennie Les Turner Phil Warrington who suffered the disappointment of being left out of the match due to the Raiders coming one rink short. These players will have preferential selection for the next game. We are now in a very comfortable 3rd position in the league. Well done Flamingos. On Friday the newly formed Cubs played away against the San Luis Pumas. Another good week for the cubs drawing on the green for the second week running yet still losing out on the shots, San Luis took the spoils 5-7. 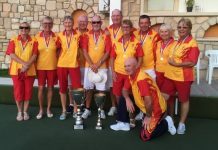 A greatly contested game with the winning rinks being – Dave Belton, Sheena Mallett, Peter Robins and Ann Barratt, Derek Lewis and John Mallett. The other game played today was at home where the Geckos in the B Division played against Quesada Swans, The match was nip and tuck for a while with the Geckos ending the first half of the season with an 8 – 4 victory. Apologies for no reports for the last two weeks but I needed a holiday and found a smashing place with a room with a great view overlooking a huge lake with snow? on the horizon. It is called Torrevieja Hospital. The Club had their Christmas Dinner last Saturday at the Posh Club which everyone enjoyed. So thanks to Jean Tregoing and her merry helpers for making it such a success. A big thank you goes to Peter Bailey who put in a lot of hard work getting some delightful prizes from J’s Bar, Palm Bar, Paulo’s Bar, Pool Bar, Ramon’s Bar, Sam’s Bar, Tia Maria, the Grill House and Posh Club itself. Great local support. Suppose I’d better say something about the bowls. 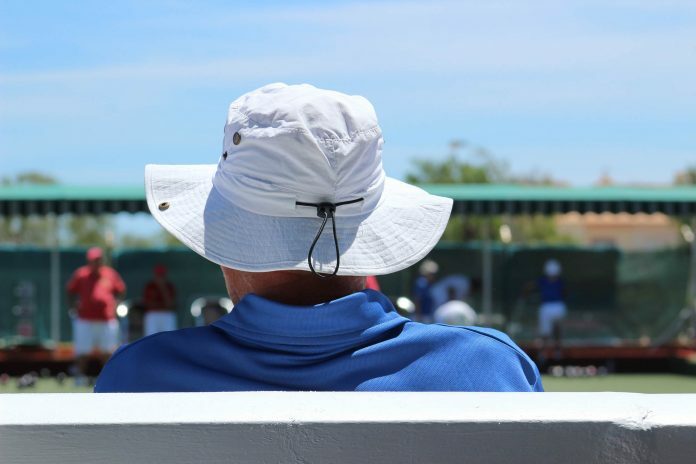 The Pathfinders went to play El Rancho Pintos but didn’t find the green to their liking and lost 8 – 4. Personally I love the green, nice and quick. John Morgan, Paul Tregoing and Mo Taylor had a good win of 25 – 18 while our four points were made by Dave Hadaway, Bernie Carr and David Taylor who won 19 – 10. Come Wednesday, come the Winter League and we travelled up the N332 to play Monte Mar. It was a good game especially as we won 8 – 4. 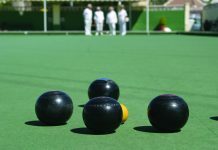 We had three winners namely Shirley Hadaway, Phil Pape, Dave O’Sullivan and Mo Taylor 23 – 10 then John Rae’s rink back to form winning 22 – 14 with Dave Taylor, Roger Stacey and Kathy Manning. Mr & Mrs T have done well this week so far. Last and certainly not least the Fowkes and the Parsons had a great victory winning by 25 shots, 29 – 4. Friday’s Southern League Div A was over at the Emerald Isle where we met the Claymores. The Ospreys came away with a great 8 – 4 win. Roy Hart still running up and down the green with Tom Spencer and Kathy Manning won 18 – 15. Another close one was Alex Whyte, Jim Reeves and Anne Stone winning by 4 shots. Mike Stone only lost by one shot and Don Fowkes with Phil Pape and Carol Smith won 20 – 11. 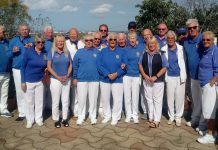 I wish La Marina Bowls Club and the rest of the Bowls Fraternity in Spain, Health and Happiness for 2019. Played away at El Rancho a great result for the Matadors. Winning on three rinks and getting the overall shots. Well done to the winning teams of Pauline Merry, June Young skip Chris Merry, Gina Hindle, Wendy Oxley skip Danny King, Lynne Armitage, Ronnie Cairns skip Dave Melville. Monte Mar Toreadors v Quesada Rubies – A very competitive match against the Rubies, the Toreadors won on two rinks and the Rubies on three. It was even honours with six pts each. Well done to the winning teams of Julia and Ian Hamilton skip Graham Smyth, Sue and Les bounds skip Joan Harding. Monte Mar Matadors v Quesada Diamonds – A hard fought game to day against the Diamonds winning on two rinks. Well done to Pauline Merry, June Young skip Chris Merry, Lynne Armitage, Ronnie Cairns skip Dave Melville. 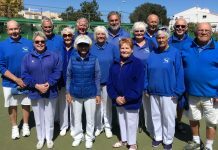 SAN LUIS BOWLS CLUB REPORT 14.12.18. Another generally sunny week although ending with heavy rain showers and very strong winds, not ideal for bowling; but we managed to complete all our matches. SA League Monday 10th Klingons home v LS Apollos; an excellent result, 130-51, points 12-0. Winners: Steve Simmons, Janet & Peter McEneany 23-13, Bob White, Sheila Cammack, Giuseppe Galelli 27-9, Ann Holland, Ray Clarke, Ray Pollock 34-11, William Holtham, Sabrina & Russell Marks 17-11, Colin Jackson, June & Keith Jones, 29-7. Trekkers away v EI Titans had a bad day at the office 52 shots -99, 0pts-12. Thursday 13th re-arranged match from 17th , a good result home v MM Matadors; shots 106-64, 10pts-2. Winners: Kevin McKenna, Marina Beardsall, Barry Edwards 31-10, Allen Bowen, Suzi Cooper, Scott Malden 24-6, Ros Holmes, Mags Haines, Les Bedford 20-8, Judy Carroll, Jo & Jules Pering 18-15. Vulcans home v LS Pioneers, a good result 80 shots-79, 8pts-4. Dennis Jackson, Cas Blay, Bob Bromley 22-8, Ian Ross, Ray Watmough, Malcolm Ayton 15-8, Kevin Hull, Charlie Marigold, Ken Dullaway 23-16. Romulans: away v LS Sputniks; shots 81-97, 4pts-8. Winners: Pat Barnes, Danny McErlean, Roger Inwards 28-11, Pat Baylis, Allan Lever, Harry Epsom 19-16. Wednesday 12th Winter League: we travelled a long way north to El Cid, but the journey was worth it: 10pts-2, 94 shots-66. Winners: Sheila Cammack, June Jones, Peter McEneany, Keith Jones 22-12, Shirley Verity, Ray Clarke, Sabrina & Russ Marks 18-15, Ros Holmes, Jo Pering, Ray Pollock, Julian Pering 16-10, Ann Holland, Keith Phillips, Dave Blackie, Scott Malden 23-11. Southern League: Friday 14h Lions, home v VB Lanzadores, a hard fought battle; 7pts-5, shots 91-80. Winners: Colin Jackson, June & Keith Jones 23-14, Kath Reid, Pam Lockett, Ian Kenyon 28-9, Margaret Morrison, Keith Phillips, Neil Morrison 18-18. Tigers, away v EI Cavaliers, 4pts-8, shots 67-106. Winners: Judy Carroll, Jo & Jules Pering 12-11, Mags Haines, Bill Webb, Les Bedford 17-14. Pumas, home v CB Cubs a good result 7-5, 88 shots-67. Winners: Pat Baylis, Geoff Francis, Ralph Jones 14-14, Pauline Johnson, Danny McErlean, Roger Inwards 14-9, Sharon Mitchell, Robert Hicks, Lyndon Johnson 34-7. Leopards a close match away v MM Toreadors, 5pts-7, 79 shots-82. Winners: Dennis Jackson, Kevin Hull, Brenda Brown 18-17, Audrey Ford, Ray Watmough, Phil Hasler 13-13, Derek Barker, Ian Ross, Geoff Shand 18-15. 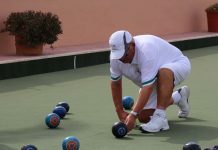 SLBC website: www.sanluisbowls.byethost7.com or contact June Jones, Club Captain: 691903773. The Dalmatians, away to Mazarron Mariners, had a tough time on Monday gaining just 3 points (78 shots to 87) from the encounter. The trio of Bob Nesbitt, Dave Champion & Barbara Scotthern once again brought home the bacon, 24:11, while Ian Robertson, Mike Bayfield and Alan Dobie scored a draw. The Pointers managed the reverse, with an impressive 103 shots to 65 against Greenland’s Chestnuts. Topping the tree were Iris Cutting, Dave Young and Dave Greenland, with a marvelous score of 36:6, helping move the team to second in the league. The Beagles were disappointed with the 4 points against Vistabella’s Albatrosses, especially as the opposition could only field 4 rinks! The only win was produced by Brian Miller, Don Whitney and Lin Miller, a squeaky 15:14, overall shots being 63:84, but the team still sits third in the table. Finally, the Alsatians away to Vistabella Drivers, gained 8 points, 73:74, with the best rink being Irene Ward, Paul Hayward & Mike Douglas, winning 22:14. Wednesday saw an early start for the Winter League squad who travelled north to take on Benitchell. Usually a tricky fixture, the team excelled with a 9:3 win, 97 shots to 72. All teams did well that day, but the best rink went to Don Whitney, Val Collier, Chris Collier & Stuart Denholm posting a great score of 25:7. On Friday, the Bulldogs faced another depleted team from Vistabella, the Picadors, playing on just 3 rinks! Winning on 2, with the best result from Anita Brown, Cliff Plaisted & Lynn Greenland – 25:14, the team landed 10 points, 74 shots to 46. The Boxers also bagged 10 points (103 shots to 62), but had to play the full 5 rinks against Monte Mar’s Matadors. Again, the scores were good across the board, but the team of day comprised Stan North, James Cutting & Dave Champion who won 27:5. A reminder that the Wasps sessions take place Wednesdays 1:30 for 2:00 – €5 for an afternoon’s bowling with shoes and woods available to borrow. Due to the popularity of the Wasps, first time bowlers are asked to attend an initial coaching session on Tuesday afternoons, starting at 1:45. 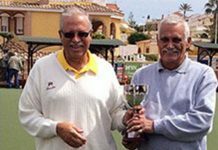 SAL Enterprise League Albatrosses went to San Miguel, they beat the Beagles…although they were a team short, well done! VB 84(8) – 63(4) SM. The Drivers were at home to San Miguel Alsatians. They had just two wins but only lost by one on the overall shot difference. VB 73(4) – 74(8)/SM. Discovery league Eagles were also at home playing the Horadada Falcons, on this occasion the Falcons soared to greater heights and took the win…a great game though. VB 86(4) 103 (8) H.
WINTER LEAGUE. 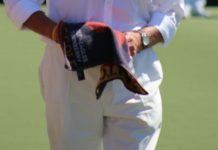 Two matches this week the first one was brought forward from 19th Dec and played at home against El Cid. The team had four wins making it a great result..the shot difference wasn’t bad either. VB 113(10) – 60(2) EC. 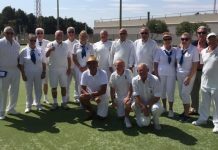 For this week’s match they travelled to Javea Green to challenge the league leaders who until then hadn’t lost a game, well done Vistabella for breaking their run which has put us top of the league…for the moment! VB 83(7) – 79(5) JG. Javea went on to win the Berleen. This was followed by a wonderful Christmas lunch for which we were truly thankful…it was yummy! SOUTHERN LEAGUE A div. The Albatrosses currently at the top of the league faced a very tough game away at San Luis against the Lions, they did get two wins and a drawn game which just keeps them above the Lions on shot difference. VB 80(5) – 91(7) SL. The Picadors were away to the San Miguel Bulldogs, unfortunately with a depleted team they had to concede two rinks…where was everyone? VB 46(2) – 74(10) SM. 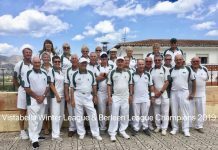 C div Swingers were home to Emerald Isle Roundheads, they also had to concede one rink but went on to win the other four, well done to them. VB 82(9) – 58(3) EI. The Conquistadors had a bye.